Here’s a startling truth. I can make you fat. Actually, I can make anybody fat. How? I simply prescribe insulin injections. Giving people extra insulin leads inevitably to weight gain. In type 1 diabetes, when insulin levels are extremely low, patients lose weight no matter how many calories they eat. Give insulin — gain weight. No insulin — lose weight (even to the point of death). The implication is clear. Insulin causes weight gain. Knowing this is crucial, because if insulin causes weight gain, then losing weight depends upon lowering insulin. But instead, we’ve been told to focus obsessively on calories. The standard (failed) weight loss advice is to restrict a few calories every day by reducing dietary fat and eating multiple times per day. This does not lower insulin much since dietary fat has little insulin effect and eating frequently constantly stimulates insulin secretion. This ‘caloric reduction as primary’ advice has an estimated failure rate of 99.5%. So, if you have tried calorie restrictionto lose weight and failed, understand this. You wereexpected tofail. So here’s the situation. ‘The Man’ tells you that obesity is a caloric balance and that you should eat less and move more. ‘The Man’ tells you to eat a low fat diet, and to eat 10 times a day. This advice fails virtually everybody. When you fail, ‘The Man’ tells you it’s your own damned fault for being such a lazy assed, floppy willed person. Hisadvice was good, ‘The Man’ tells you. You were just a failure. That’s what ‘The Man’ wants you to believe. The second and equally important part of lowering insulin is understanding the question of ‘when to eat’. 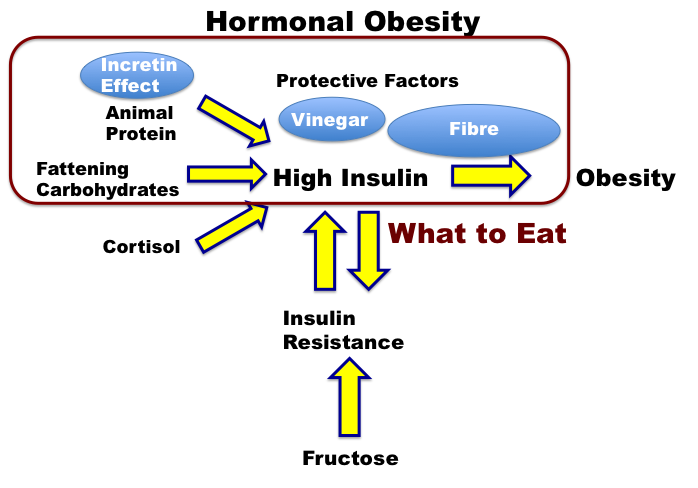 All foods can raise insulin, which leads to obesity. 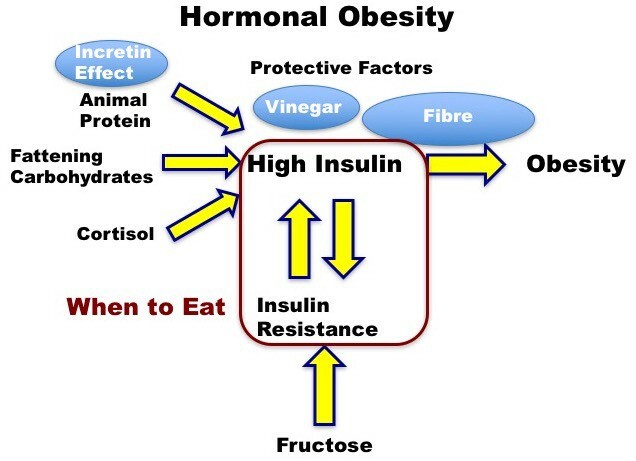 But there is another important contributor to high insulin levels outside of food — insulin resistance. This refers to the situation where normal insulin levels are unable to force the blood glucose into the cells. In response, the body raises insulin in a knee-jerk reaction to ‘overcome’ this resistance, and these high levels will drive obesity. But how did insulin resistance develop in the first place? Our body follows the biologic principle of homeostasis. If exposed to any prolonged stimulus, the body quickly develops resistance. A baby can sleep soundly in a crowded restaurant because the noise is constant, and the baby has become noise ‘resistant’. But that same baby, in a quiet house, will wake instantly at the slightest creak of the floorboards. Since it has been quiet, the baby has no ‘resistance’ against noises and thus awakens quickly. Somehow, we moved away from this traditional way of eating and now eat constantly. We are hounded to eat something the minute we get out of bed in the morning whether we are hungry or not, believing that eating white bread and jam is better than eating nothing at all. We are pestered to eat throughout the day and not stop until it is time for bed. Large surveys show that most Americans eat 6–10 times per day. Now our body spends the majority of time in the fed state, and we wonder why we can’t lose weight.